276 pages | 50 B/W Illus. Abu Dhabi’s urban development path contrasts sharply with its exuberant neighbour, Dubai. As Alamira Reem puts it, Abu Dhabi, capital of the United Arab Emirates since 1971, ‘has been quietly devising its own plans … to manifest its role and stature as a capital city’. Alamira Reem, a native Abu Dhabian and urban planner and researcher who has studied the emirate’s development for more than a decade, is uniquely placed to write its urban history. Following the introduction and description of Abu Dhabi’s early modern history, she focuses on three distinct periods dating from the discovery of oil in 1960, and coinciding with periods in power of the three rulers since then: Sheikh Shakhbut bin Sultan Al Nahyan (1960–1966), Sheikh Zayed bin Sultan Al Nahyan (1966–2004), and Sheikh Khalifa bin Zayed Al Nahyan (2004–). 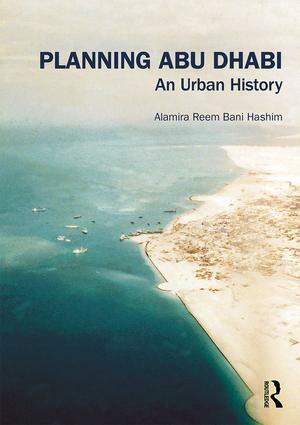 Based on archival research, key interviews and spatial mapping, she analyses the different approaches of each ruler to development; investigates the role of planning consultants, architects, developers, construction companies and government agencies; examines the emergence of comprehensive development plans and the policies underlying them; and assesses the effects of these many and varied influences on Abu Dhabi’s development. She concludes that, while much still needs to be done, Abu Dhabi’s progress towards becoming a global, sustainable city provides lessons for cities elsewhere. Alamira Reem Bani Hashim has a PhD in City and Regional Planning from the University of California, Berkeley, USA. She is the first Emirati woman to be awarded a PhD in Planning.